This is a magisterial volume, which Matthew Ridley praised in his Times of London review, saying “It is so rich in vocabulary, allusion and fact as to be a contender for the great book of our age.” That is not an exaggeration. As would be expected of any economic history, McCloskey emphasizes the material advancement that has transformed human lives in so much of the world since 1800. Finding that that the cradle of this advancement was northwestern Europe, and in particular the Netherlands and Great Britain, McCloskey rejects notions of geographic or cultural determinism, suggesting it could have arisen from other parts of the world, especially China and India. She rejects the idea that the progress of the previous two centuries represented the continuation of progress already underway. Indeed, annual economic growth had staggered along at from less than 0.1 before 1800. McCloskey contrasts this with what she calls a “hockey stick” phenomenon, in which per capita incomes grew by factors of from 10 to 30 times --- 1,000 percent to 3,000 percent per cent from 1800 to 2010. The problem was the bifurcation of society into a small privileged class and a far larger number of commoners, the bourgeoisie. Opportunity was largely limited to the privileged class. Throughout the book, McCloskey provides useful observations. She challenges much of “progressive” thought, noting that protection of trades and jobs is inappropriate and that government should not be in the business of choosing winners (or losers). She discusses “first act, second act and third act” economics, which requires competent analysts to look beyond the immediate consequences to the ultimate consequences of policy. Henry Hazlitt made this the core of his best-selling book Economics in One Lesson, seven decades ago, though economists, often working for governments, have not always heeded this advice. Bourgeois Equality is the second of two great volumes on economic history in just a year. The first was The Rise and Fall of American Growth: The U.S. Standard of Living Since the Civil War by Professor Robert Gordon of Northwestern University, a long ride on the Chicago El (Metro) from McCloskey’s University of Illinois, Chicago . Both volumes are yet more evidence of Chicago’s high density of ground-breaking economic analysis. The setting of the two books is considerably different, with Gordon focusing on the United States and technological advancement. Gordon is somewhat more pessimistic about the future, which is understandable from his historic analysis. McCloskey’s view is more optimistic. "Pessimism on the basis of the most alarming of today’s trends is jolly good fun. … But since 1800 it has been a poor predictor." For decades there have been debates about “trickle-down economics.” More recently, Nobel Laureate Paul Krugman characterized the Obama stimulus programs as “trickle-up economics” (the effect of which is debatable). Professor McCloskey tells us that that economic growth comes from ordinary people not by the beneficence of those above. We could call it “trickle-out” economics.” To the considerable extent her analysis is right, McCloskey describes that may be the ultimate flowering of democracy. 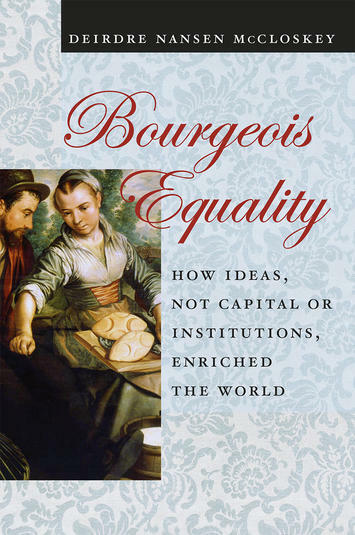 Photo: Cover: Bourgeois Equality: How Ideas, Not Capital or Institutions Enriched the World.